For archaeologists, the word “Eden” is what best describes Egypt. The Egyptian sands are an ongoing source of new scientific discoveries such as one of the Seven Wonders of the World, the mythical Lighthouse of Alexandria, destroyed by an earthquake in the fourteenth century. Today, visualizing this unique work of art is a difficult challenge. In Thebes, a team of archaeologists sheds light on the famous Ramesses (Ramses) II, the greatest of pharaohs, and his Ramesseum, also called the "palace of a million years". Here, we discover the world’s first library! The tomb is comprised of 22 rooms, spread underground over three levels and built by the lector priest and royal scribe Pediamenopet. He amassed enough wealth and power to build this incredible labyrinth tomb. 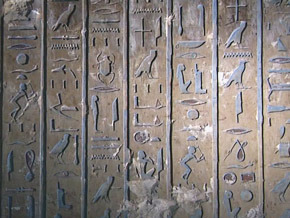 The walls are entirely covered with ancient funerary hieroglyphic inscriptions.